go to source for all the photos ! “We could draw a curve of hope,” notes Campi. The photographer recounts the intense stress of migrants at each border crossing, the hope for a better life that is reborn upon arrival in a new country. Then, this glimmer of hope is gone, crushed by the obstacles along the waz. 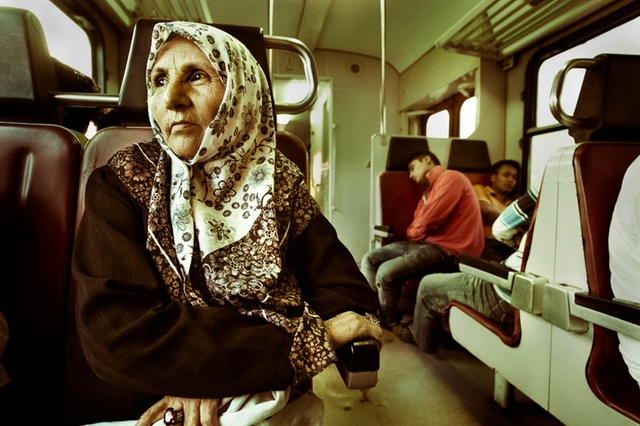 The winner of the 2012 Swiss Photo Award travelled across Europe from 2012 to 2017, immortalizing the situation of migrants. Her work includes an exhibition entitled “Beyond Borders: Migration and Differences” organised by the NGO Alliance Sud. At the heart of it: the notion of border, both the geographical markers and the mental divides that keep people separate. Alberto Campi was born in 1982 in Italy, a few kilometres from Switzerland. “I am a person who grew up on the border in the good old days of the European Union,” he says. For him, preventing people from freely passing through is absurd. In 2012, at the beginning of the Syrian crisis, he spent three months in Greece. “I was shocked by the violence against migrants by the authorities, by the police,” he recalls. His route then led him to the Balkans. In Serbia, he discovered “the magnificent relationship between the population and refugees”. “For me, it was an example of the humane treatment of migrants. They were well received, without victimisation,” continues Campi. Through his lens, the photographer observes the boundaries but the changes he sees frighten him. “Everything is closed. We are recreating borders in people’s minds,” he says. “It makes more sense than presenting an exhibition in a gallery. You have to go and get the audience where they were born,” says the photographer.